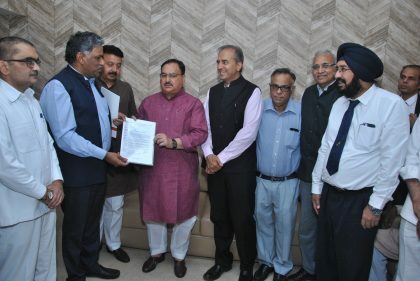 New Delhi: The recent meeting held between officials of Association of National Board of Accredited Institutions ( ANBAI), the body representing DNB candidates and the Health Ministry, ended on a positive note for DNB doctors looking to medical academia, after the Health Minister Shri JP Nadda assured that they would be given equivalence to MD/MS degrees as per the 2012 GOI gazette notification. Moreover, a further setback comes to DNB candidates after the Parliamentary Standing Committee on Health and Family Welfare on the issue of National Medical Commission Bill has now recommended that “DNB qualification awarded by NBE shall be equal in all respects to the postgraduate qualifications, granted by MCI, except in relation to teaching in medical colleges. Demanding equivalence for NBE qualifications, ANBAI held a meeting first with the PMO and now with the Health Ministry, asking then to establish equivalence as per 2012 notification. i)Those candidates who have undergone DNB training in an institution which now runs MCI recognized postgraduate degree courses in a given subject, the’ DNB qualifications shall be considered at par with MCI recognized qualification in that subject only. 20 beds per unit teaching beds. Such qualifications shall be considered at par with MCI recognized qualification. (iii) Additional training of one year for equivalence of DNB abroad specialties with MD/MS & DNB(super-specialities) with DM/M.C.h- Those candidates who have undergone DNB training (both broad specialities and super-specialities) in hospital/institution other than mentioned in (ii) above, shall undergo one additional year of senior residency or equivalent training or research job in a MCI recognized hospital/institution, provided such qualifications are notified in the Postgraduate Medical Education Regulations 2000″. To provide a unified voice to DNB passouts across the country, ANBAI, the umbrella body of National Board Accredited Institutions has announced the formation of the DNB Alumni Association. This comes after the ANBAI Governing Council approved the formation of a DNB Alumni And Teachers Committee, which will represent the NBE qualified specialists from all over India. In the past, ANBAI has been instrumental in getting major policy changes for the benefit of DNB candidates, including the equivalence of DNB with MD/MS/DM/Mch degrees with certain criteria in 2012. Sense finally prevails. Enough of somersaults. In jayadev hospital bangalore Cardio thorasic wing deploying duties to their students thirty six hours duty and alternate night duties.Is it correct.What about their health and thei who look after their children. Plese do justice to mch students of cardio thrasic surgery. Mch cardiotherosic surgery in jayadev hospital bangalore deploying to students alter nate night duties and thirt six hours duties. Is it correct what about their health and what about their family and their children. Even Apex court has considered DNB equalent to MD. I feel the GOI 2012 notification is appropriate.